In 2004, the HKSAR Government has announced the New Nature Conservation Policy. Since December 2005, HKBWS began to implement a wetland conservation and management project in Long Valley which is funded by the Environment and Conservation Fund (ECF). With cooperation with local stakeholders, specific wetland management practices were conducted in order to enhance the ecological value of Long Valley. The project also aims at raising public awareness on Long Valley and wetland conservation. Starting from March 2008, HKBWS and The Conservancy Association (CA) cooperated and applied for funding from ECF for the project “Nature Conservation Management for Long Valley” in order to extend the habitat management practices. Encouraging result was obtained in habitat management, bird monitoring and environmental education. For more information, please visit our forum for more update information about Long Valley or contact our assistant project manager. Since the publication of A Field Guide to the Birds of China in 2000, birdwatching has become a more and more popular acitivity and the number of birdwatching societies established in different parts of China mainland has also increased. In view of this, HKBWS cooperated with BirdLife International to launch the China Programme since April 2005 under the support from Darwin Initiative. The Programme aims at helping the establishment and development of birdwatching societies in China mainland, and also increase their ability in conservating birds and habitats. 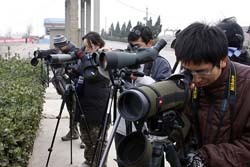 The China Programme is very successful and up to now, 27 emerging or established Chinese birdwatching societies have took part in activities organized by the Programme including training workshops related to waterbird and forest bird surveys, environmental education and Important Bird Areas (IBA). The China Bird Festival which is organized every October has been held in 14 Chinese cities with the participation of more than 90,000 citizens. If you want to know more about the China Programme, please visit our China Bird Net website or contact our China Programme Officer. Since September 2005, HKBWS has launched the China Coastal Waterbird Census in which monthly waterbird census along the eastern coast of the China mainland are carried out. At present, the survey areas covered include Dandong (Liaoning Province), Tianjin, Cangzhou (Hebei), Yellow River Delta (Shandong), Shanghai, Fuzhou, Xiamen, Haifeng, Shenzhen and Hong Kong. Chinese Crested Tern is a Critically Endangered species with a world population of less than 50 individuals. Up to now, their breeding sites can only be found in Mazu and islands in Zhejiang and a staging site in Min Jiang estauary (Fujian Province) was recently discovered. 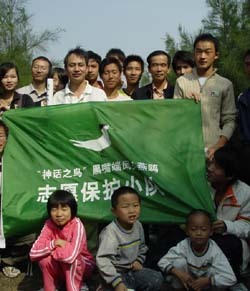 In order to find some new potential breeding sites in Fujian Province and raise the public awareness about this bird species at school and communities, HKBWS coorperated with BirdLife International and Fujian Bird Watching Society to implement the Action for the Critically Endangered Chinese Crested-tern project. From July 2008 to December 2009, China Coastal Waterbird Census and Action for the Critically Endangered Chinese Crested -tern project are partly sponsored by Ocean Park Conservation Foundation, Hong Kong.